Italian design studio Studiomobile has teamed up with the University of Florence to create a prototype drifting greenhouse. 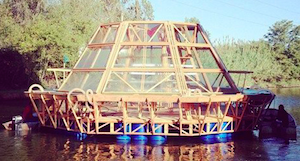 The Jellyfish Barge runs off-grid and makes its own fresh water through an onboard system of solar distillation. The Jellyfish Barge consists of a glass greenhouse underpinned by a wood infrastructure. It can additionally be connected to virtually any number of other Jellyfish Barge systems making a larger overall structure. Inside the greenhouse, water for crops is generated utilizing solar energy stills. The greenhouse can use the water it sits on for irrigation, whether that happens to be fresh water, ocean water, and even polluted water. The water is made useable for irrigation by treating it with 7 solar stills. There’s also a rainwater catchment device aboard and Studiomobile claims the Jellyfish Barge can generate around 150 liters of fresh water each day. The Jellyfish Barge includes hydroponic equipment too, that Studiomobile states is quite effective and can save approximately 70 percent more water compared to conventional hydroponic systems. This system can easily make use of around 15 percent seawater in order to enhance performance. The automatic system provides distant monitoring and also management of the hydroponics. Studiomobile says that one Jellyfish Barge can produce adequate food to sustain two households.